Somewhere between the lo-fi bedroom pop of Alex G and the classic 90s sound of Pavement lie Melbourne four-piece RAT!hammock. Unassuming but delightfully weird, RAT!hammock mine much-traversed indie rock terrain, but prove that there are still many diamonds to be found in the rough. The release of new single ‘June’ looks to increase their fledgling fanbase significantly. Equal parts dreamy and quirky, ‘June’ turns RAT!hammock’s style technicolour, adding in new vocal modulations, anthemic breaks and gorgeous backing vocals courtesy of Merpire. 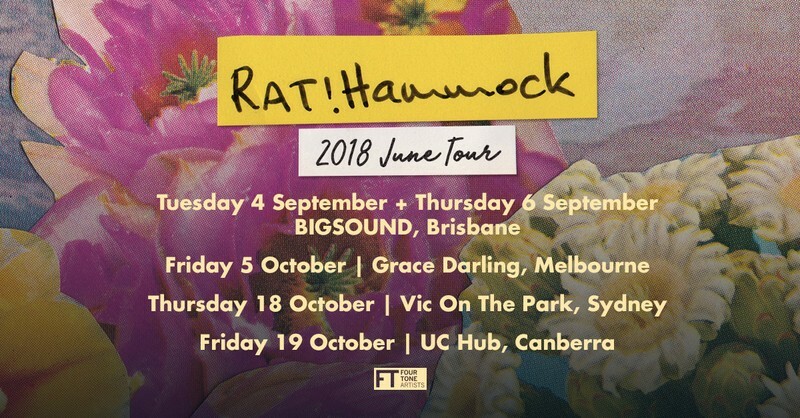 This growth in songwriting prowess and technical skill coincides with a significant growth in profile: RAT!hammock are set to showcase at Bigsound this year, release a sophomore EP, and play launches in support of ‘June’. It’s going to be a significant six months for the band, but they’re more than up to the challenge. Recorded at Northcote’s Los Bomberos Studios by Sam Swain, ‘June’ doesn’t just make good on all the promise and potential that RAT!hammock have shown over the past eighteen months; it leaves it in their dust.